1. Preheat the barbecue (griddle or grill). Prepare the tamari miso glaze while the barbecue coals are coming up to temperature. Combine the tamari, miso paste, maple syrup, rice vinegar, garlic and ginger in a small pan and set aside. 2. Trim and discard the stalk from the aubergines and cut each one into 4 long, thick slices. Brush both sides of each slice with sunflower oil and cook on the barbecue for 4-5 minutes until just starting to char and soften. 3. Sit the pan of miso sauce on the barbecue rack near the outside edge where the coals will be coolest. 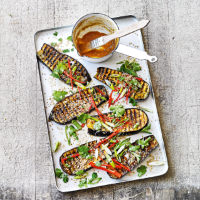 Brush the aubergines with the miso sauce and flip the slices over on the barbecue grill. Brush the other side with sauce and continue to cook, turning another couple of times and brushing with more sauce each time. The aubergine should be soft and the flesh caramelised. 4. Arrange on a plate and scatter with the toasted sesame seeds, coriander, salad onion and red chilli. Warm any remaining glaze and drizzle over with the sesame oil, then serve.